Toga parties are not just for college kids. Adults and children also enjoy dressing in traditional Greek attire for celebrations and other events. 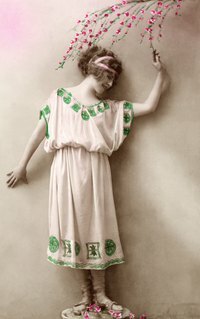 There is no traditional Greek toga, so women can enjoy a lot of creativity when creating their own toga. With about six yards of fabric, which are usually 44 to 45 inches wide or less, you can make a form-fitting, modest toga that looks authentic. Lay the fabric flat and leaving it spread wide, wrap it around yourself once; twice if you want more coverage. Now make a belt by gathering the fabric together and wrapping it all around your waist once. As you come around your waist, bring the belt up around your neck. Wrap the belt around your neck and come back down in front of your chest, securing the remainder under the belt. Depending on how much material you have left, you can either tie it in front or back of your toga. Pull your hair up into a bun on top and let it fall out the back or wear a headdress of some kind. Stand, holding a twin bed sheet in front of you long-wise and fold it until it’s about as wide as your body. Now, lay it flat and do the same with a second twin bed sheet. Afterwards, fold each sheet so that it’s about twelve inches shorter than your height. Safety pin this section of the sheet down. This will be the bottom of the Toga. Now, take the top two corners and pin them on each side. Pull over your head and you’ve got a traditional Stola. You can now pin at the sides, add a belt, a brooch, or any other adornments you like. You may want to wear a swimsuit top or tank-top underneath. Hold a twin bed sheet horizontally and wrap it around your waist once or twice, securing it with a safety pin. Hold another twin sheet and toss it over your shoulder, bringing it around and pinning it to the waist on the side or tying it together where it meets underneath your arm. You can also tuck it into the first sheet at the waist. You can opt to wear a swimsuit top underneath, tank top or T-shirt. Don’t forget headwear and sandals or you can go barefoot. Wrap a twin bedsheet around your back, gathering the ends in your hands and simply wrap the ends around either side of your neck. Tie it behind your neck and it’s a halter toga. Also, you can wrap the sheet around you and simply tie it in the front across the top of your breasts. Be sure and pin it all down the front or wear something underneath. Use some gold ribbon or rope for the waist and add gladiator sandals.